Both soapi.info and skysanders.net have been offline for a while. The application readme file and hosting will be moved to http://soapi.info/tools/soddi.aspx. Links are in the readme text below. (MySQL and SQLite drivers are included). will present a [Windows Forms] interface. browse to the uncompressed data dump, accept the default SQLite provider selection and click 'Import'. SOURCE          The directory containing the individual site directories. parser will interpret it as an escaped quote and puke. schema named as the site data being imported. e.g. so.Users, meta.Users. The tables are dropped before import. the Sites list item schema in the GUI. rows in a separate PostTags table. INDICES         Enables useful indexes on each table. FULLTEXT        Enables a full text index on Posts.Body and Posts.Title - SQL Server only. BATCH           Number of rows inserted in each transaction. Default 5000. UI will be populated with the supplied arguments. The console window will remain open to receive all debug and error output. in SOURCE will be imported. To specify a different target name simply treat the site name as a parameter. In GUI mode you may edit the schema item in the Sites list. Options are not case sensitive. soddi source:"F:\Export-030110" target:"data source=(local);initial catalog=SOData;integrated security=true;Provider=System.Data.SqlClient"
04/09/2010 - Explicitly set platform to x86 to allow same binaries to run on x64. 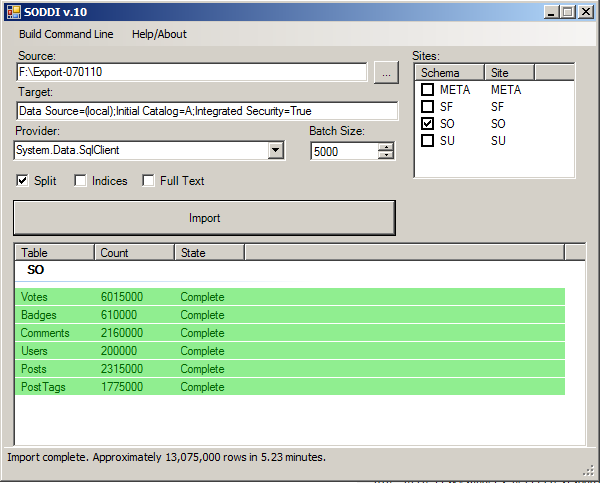 My experience with the October and November 2010 data dumps importing to MSSQL. The latest data dump requires that you do a couple of things in order to use this. The format of the folder needs to be MMYYYY Schema. So, for the Web Apps data dump, I have 2 folders, 112010 WA and 112010 MWA. The database tables will be <database>.WA.Users and <database>.MWA.Users etc. Expand the About Me column. The About Me column within the built project is 2100 characters. This is too short. I didn't play around with what the length needs to be - I just went with NVARCHAR(MAX). If you don't care about the Users table, step 2 isn't necessary. Chances are you'll want the users table though I suppose. If there is enough interest, I will do the work to get this to compile and run on Mono for the LAMP folks. I see a little interest. I am currently focusing my free time, free as in beer as I am currently without job (hint, big freakin hint), on polishing http://soapi.info and it's offerings. A bit more interest and I will carve out a day to make this happen. I have the XML files (for example, users.xml and votes.xml) for Stack Overflow data in a folder called 'c:\sodump'. I fire the command below (I am using Windows 7), but it does not import any records. I would appreciate any help or pointers to possible solutions. I would like to import Stack Overflow data into MySQL. Import complete. Approximately 0 rows in 0.00 minutes. There is an issue with a case sensitivity of table names within SQL generated for MySQL. Table creation statements use lower case names of tables and insert statements use mixed case names so the importer cannot work with a MySQL database on Linux. Is there a way to make it work with MySQL on a Unix platform? can anyone please explain HOW the source directories should be arranged, I have the stack-overflow xml dump (users.xml , posts.xml , votes.xml) inside a directory , I select it as the source directory , but can't get them imported , it tells me "Invalid source path." and also the sites list is empty! Very useful tool and very well programmed. However, it doesn't work with latest Aug-2012 data dump. Probably XML schema of dumped data changed from previous version, and now for questions and answers without views, the value for the attribute ViewCount is an empty string. That cause the error mentioned by others in this post "Input string was not in a correct format" when the empty string is trying to be converted into a number (Int32). Solution (that worked for me) was make a simple modification on the source code to handle this case. Thanks Sky Sanders for this awesome tool, performance is very good too! It's very efficient with memory consumption, it uses the original schema, it checks the data (serialization to type - exception if invalid), and it works on Linux/Mono, too. You could also add Firebird easily (just create the schema and change the DataProviderFactory initialization). Not the answer you're looking for? Browse other questions tagged app data-dump . Has anyone *implemented* the Stack Exchange API on top of a public database dump?